I wanted to soak in a bath for days, and cleanse myself of The Misters, of my life. This way he spoke set off the voice in my head, which said to run. Their game grew tiresome. My arm throbbed, my head hurt, and I needed rest. Yes, even more than wanting to feel the magic in my blood or drinking Branagh’s Ale to excess, I needed rest. I would not send a body to Saint James for a funeral. I would not subject his loved ones to such senseless loss. To kill and live was no choice. It was a mandate to end Ash as I knew him. Many sins I committed, but of physical murder, I remained innocent. The canon within me howled in anger and despair. Like Joseph, I should have fled and removed myself from the situation. Yet no one could flee The Misters. No one escaped their justice. Those who tried always died horrible, violent deaths. Always. I might not be a murderer, but I was a coward. I was a thief. A quitter. A failure. Why else would I let myself fall into the trappings of my addiction? So did it matter if I became a murderer, too? Unease moved from my belly and into my throat like I swallowed a pint of lamp oil. I wanted to soak in a bath for days, and cleanse myself of The Misters, of my life. Mister Mercy asked, “What is your decision, hmmm?” His tone was too eager, too full of self-satisfaction. “I’ll do it,” I whispered so low I almost couldn’t hear my own words. Did I want to hear them? He should have asked, “What worse assignment?” They just introduced new rules to their cruel game…unless they wanted to elicit a reaction from me, one worthy of death. Though my insides roiled with anger, I tried to maintain a calm demeanor. Silently I yelled, “The banker’s assistant who has to account for every shilling and pence that comes through her ledgers? The same lady who wears dresses of a most exacting standard, who believes that a worthwhile evening is spent at an opera? The same lady who dared to call my life a bore? Who wanted no part of it? Who rejected me? Who threw my love back in my face? Who said I neglected her for two years and convinced the magistrate to agree? Not our dear Aimee. My dear Aimee. No, Ash…don’t be a fool. She isn’t yours anymore – if she ever belonged to you at all. The accusation hung in the following silence. I wanted to yell, to tell them they were wrong. I knew Aimee like no one else. Did they know she slept on her right side? Or that she had such nightmares she often awoke twisted in sweat-soaked linens? Did they know a ray of sunlight through a slit in the curtains made her smile? Did they know she yelled and screamed when she was angry, especially if I dared to buy a bouquet for her without her approval? Because I spent coins not authorized by her accounting? Aimee. My dear, beautiful Aimee. Once a fine, upstanding member of society, Alexander Asherton has reached the low point of his life. Once he had prospects. A place in society. Once he had a beautiful wife. But that was before Aimee left him, before the explosion…and before magic. His promising future with the Church of England went up in flames with the explosion that wrecked his body. Now he works for the cruel and mysterious Misters, who keep him awash in the magic he needs to feed his addiction. The magic he needs to live. His only comfort is that he doesn’t do wet work. He’s a thief, not a murderer. When they demand he assassinate his ex-wife and steal a dark magical item from the powerful and twisted Duke Schaever, he doesn’t have a choice. The Misters hold the key to his life…and to his death. But all he’s got left is that he isn’t a murderer. Who is Ash really? A priest or a killer? An addict, or a hero? And what is the strange and deadly merging of science and magic that serves the Duke? 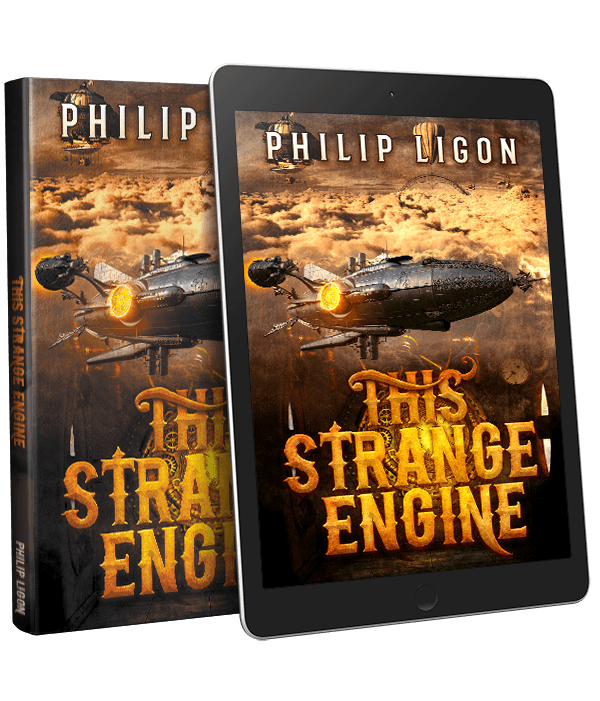 Philip Ligon’s debut steampunk fantasy twists and turns through a dystopian, alternate Victorian England. Full of magic, elves, dragons, and betrayal, this book will satisfy the most avid fans of dark fantasy and twisted steam-powered machines. Is Ash truly lost to addiction and darkness, or if he can become something more? Find out by reading This Strange Engine today.